This morning I took a lap around the property with camera in hand. Here’s what I found. 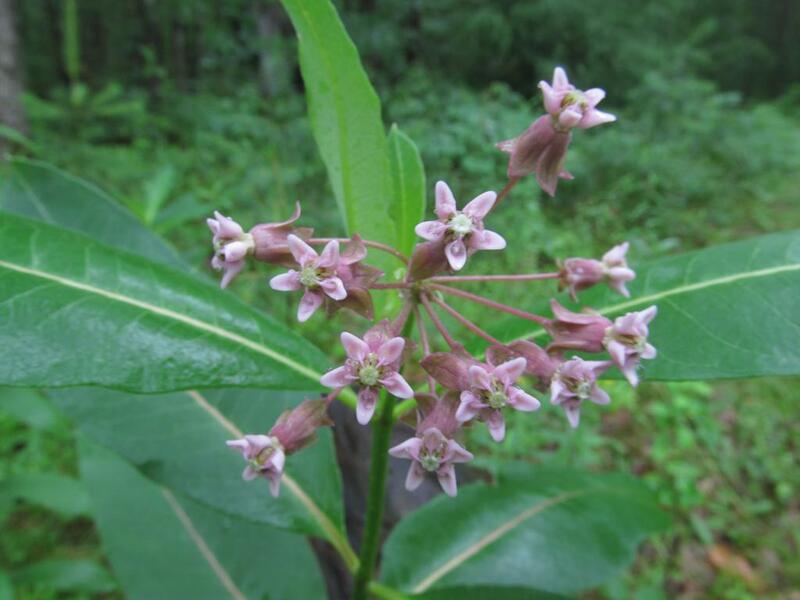 The “regular” milkweed is in bloom now. I have a lot of this stuff on our land now. When we first moved here, there were only three or four plants, but I let it grow. This year there are about a hundred of them. I’ve been eating them too, and like them very much! 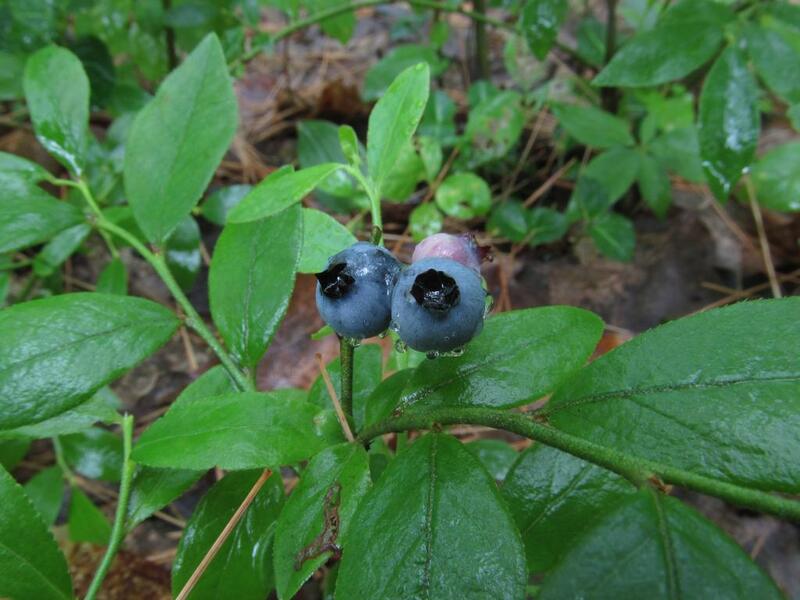 There are a lot of lowbush blueberry plants here, mostly in the woods (as were these). 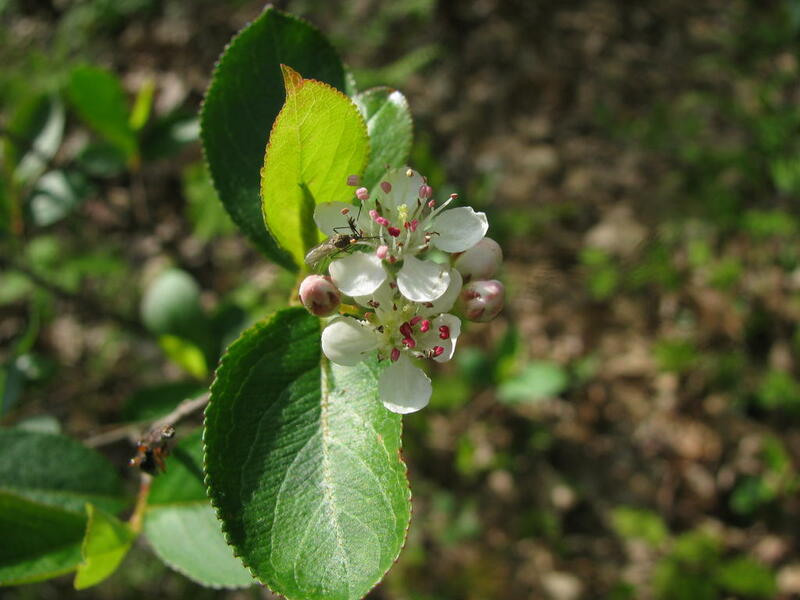 They do not produce a lot of fruit though, probably because they are in the woods where they don’t get a lot of sun. 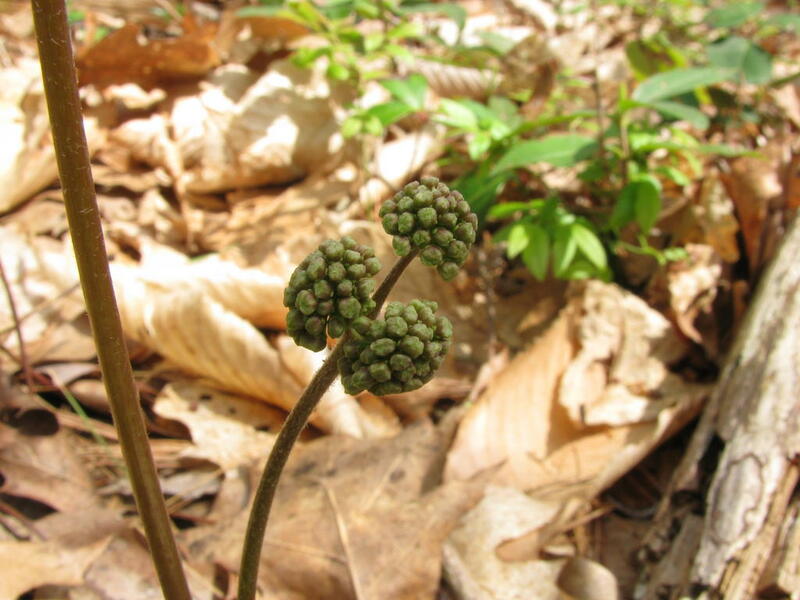 The roots of sarsaparilla can be used to make a root beer, but the fruits are not edible. 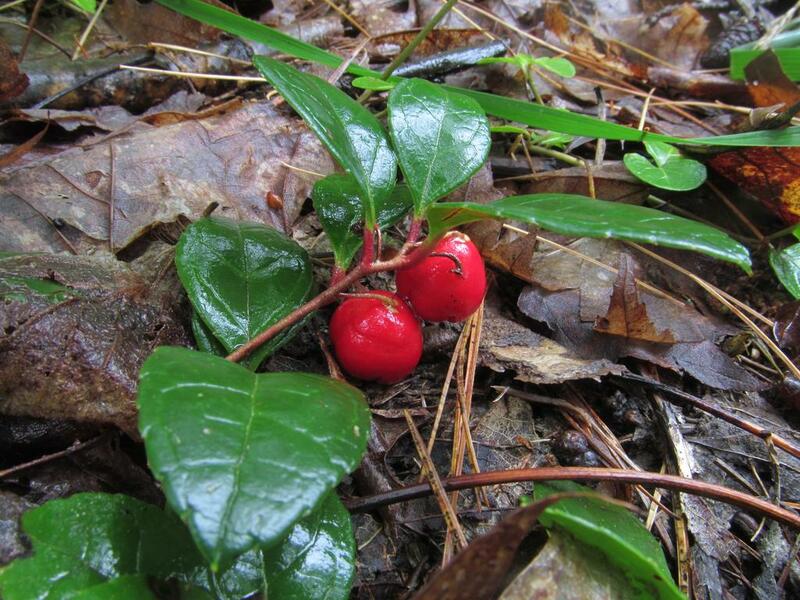 The berries on the wintergreen plants that still have them are huge. They are about the size of a pencil eraser most of the year, but these two were the size of dimes. 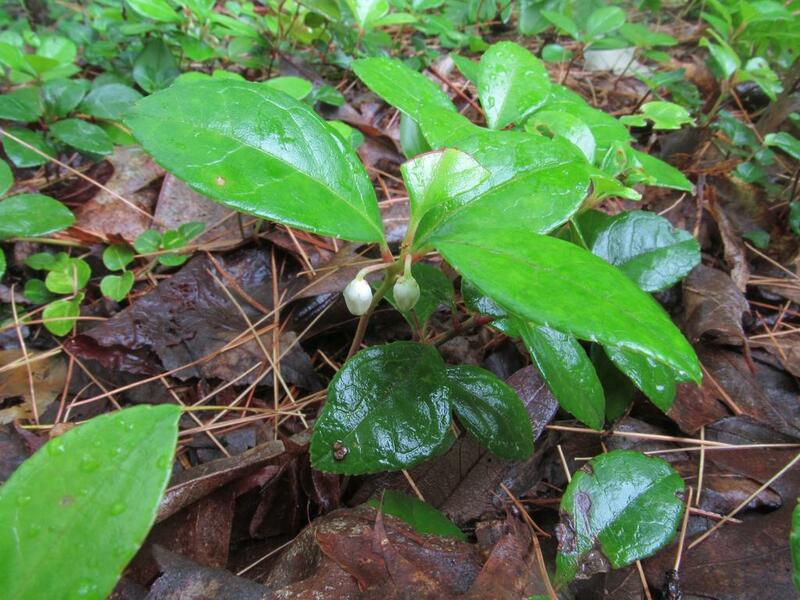 The wintergreen is getting ready to bloom. This one was the farthest along of any I saw today. I expect that by the end of the holiday weekend, they will open. 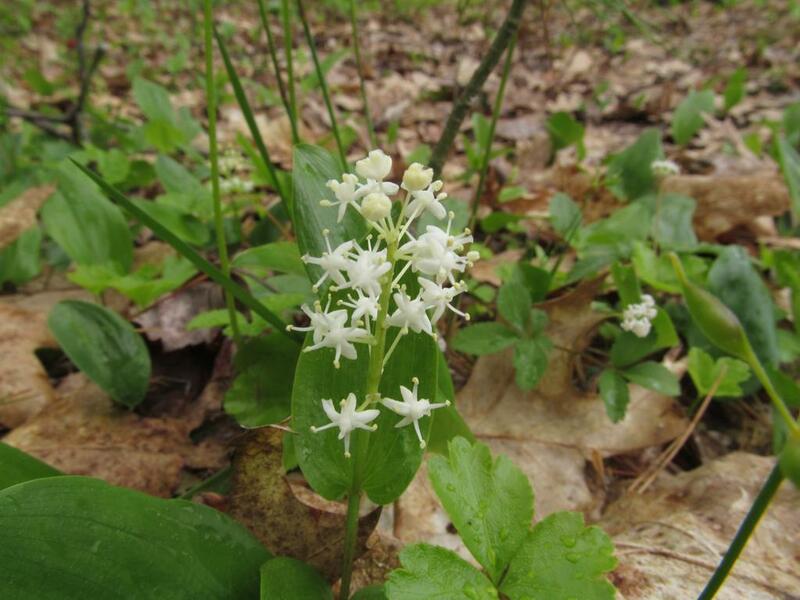 There are a lot of these in my woods right now. You can hardly throw a stick without hitting one. Another name for this is “false lily-of-the-valley”, but as I’ve said before, I don’t like that name. 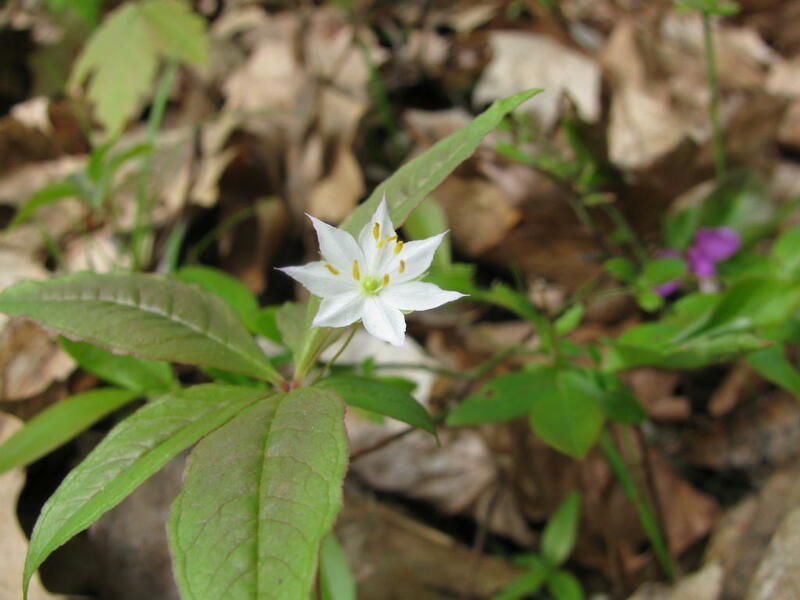 There is nothing false about this plant, and like the starflower, it is quite abundant in my woods right now. It’s everywhere. 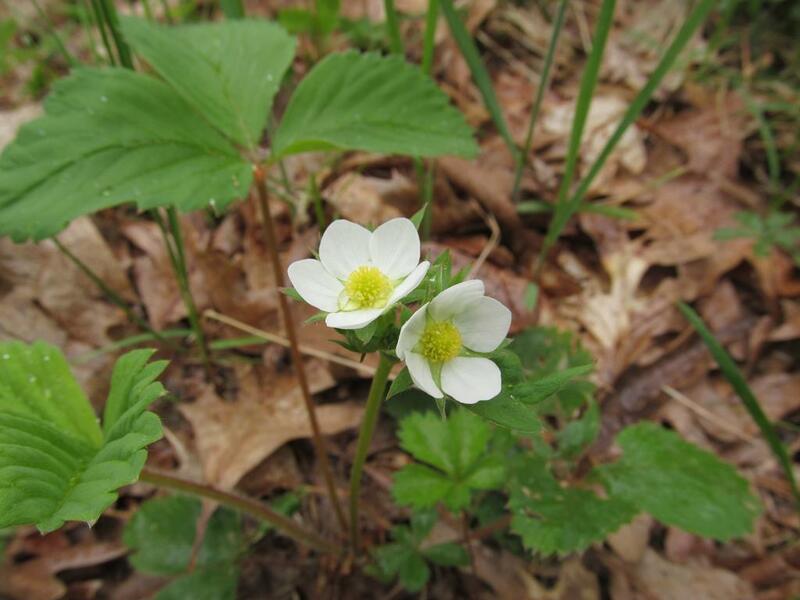 The wild strawberries have decided to come up in the backyard along the edge of the woods. These usually come up by the driveway (and they have again this year), but I don’t recall having seen them in the back until this year. 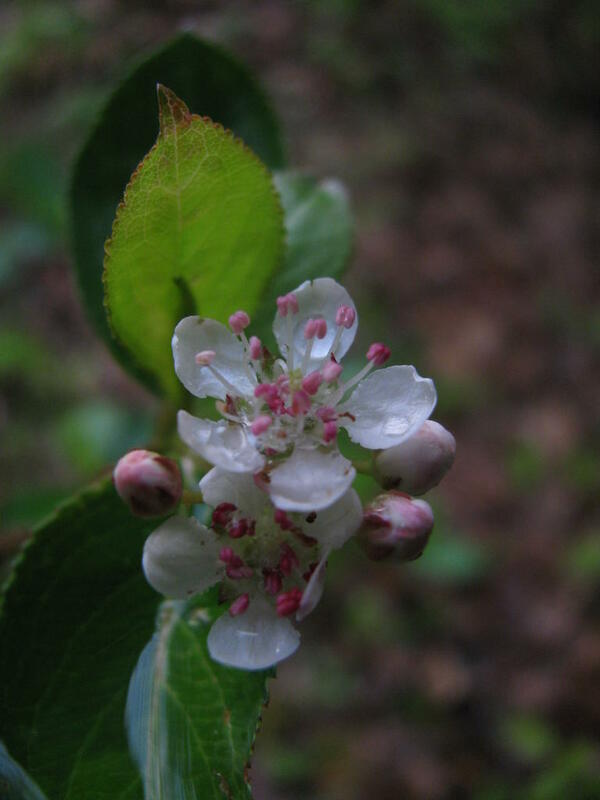 The sarsaparilla is blooming now too. 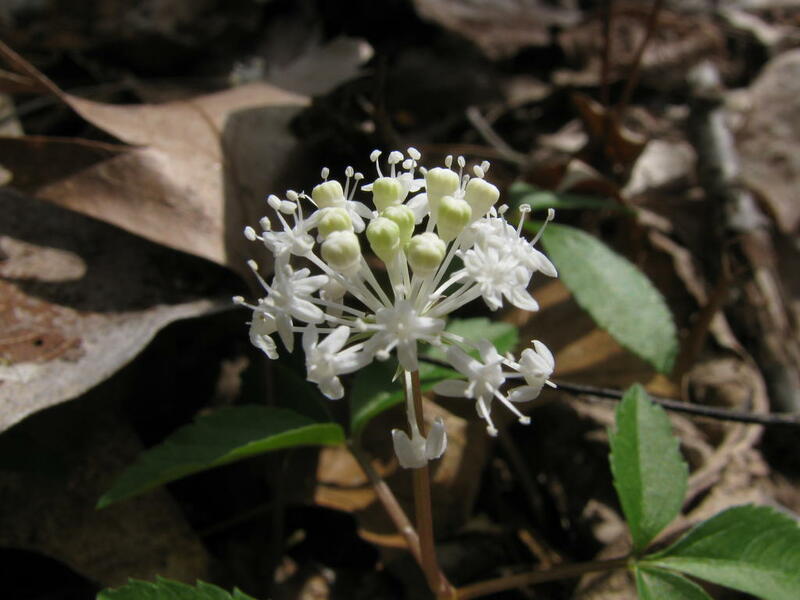 Not all of these make flowers, but the ones that do often make two umbels, as this one did. 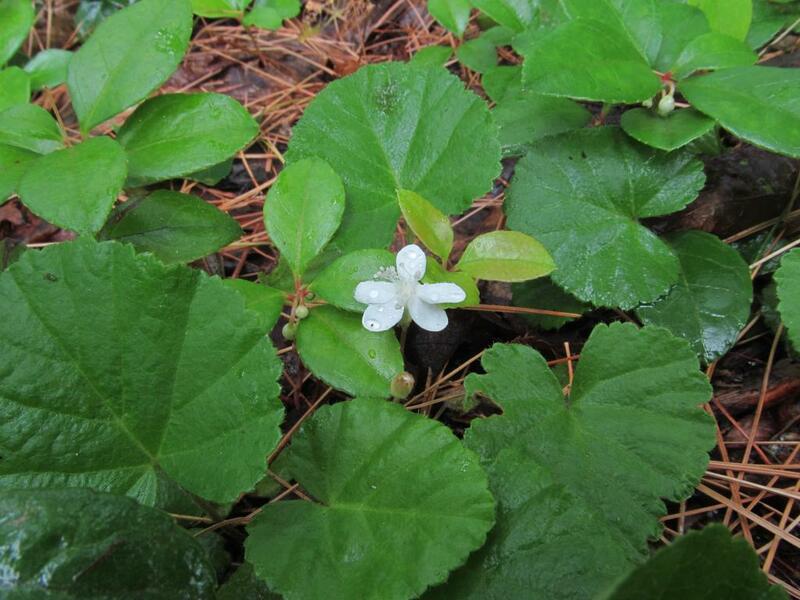 Bunchberry is in the same genus as the dogwood tree, which has always struck me as odd. How can a forb be in the same genus as a tree? 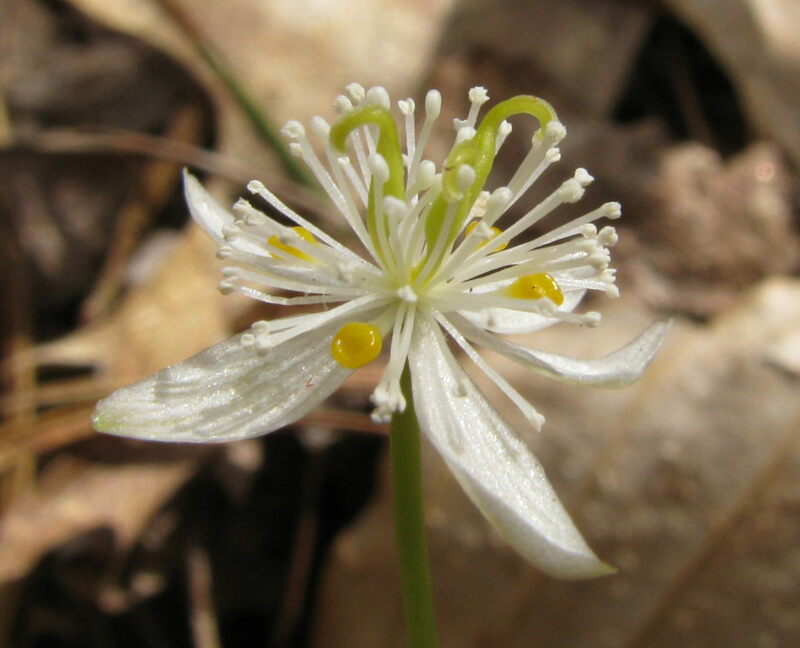 I looked for this particular specimen earlier this spring because I know right where it comes up. It was almost four inches tall when I first saw it, but look at it now. Someday I know that Penny is going to take this one out with a stick, as it grows right along the edge of our path, and Penny tears through there heedless of the flora while carrying a stick in her mouth. 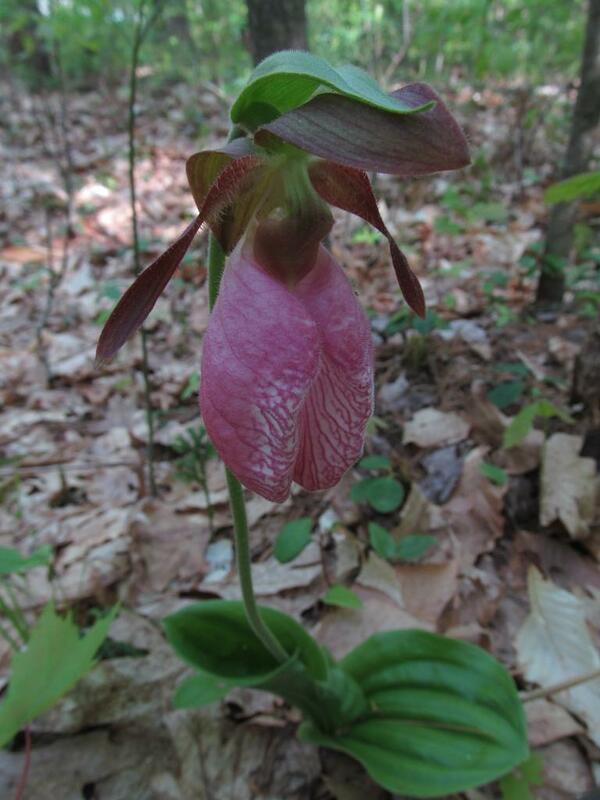 There are another half dozen of these elsewhere in my woods though, and they seem rather abundant in other places too. But this is the only one I look for before it sprouts. 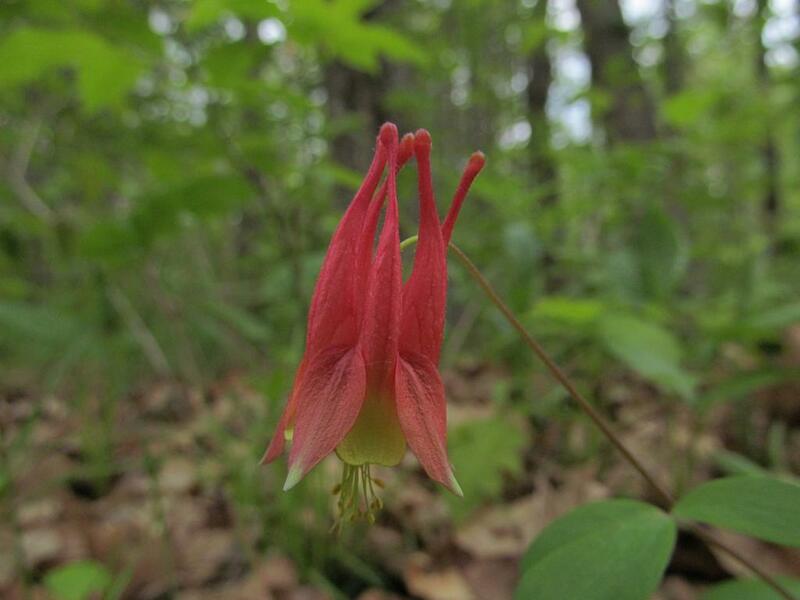 New Hampshire Gardener posted a shot of Wild Columbine today, and I lamented in his comments section that some used to grow near the catchment pond on my property (I don’t call it “my” catchment pond, because the city built and maintains it). I hadn’t seen any for three or four years. But I went out there tonight after reading his post just to make sure, and what do you know? These are shots I took mostly at my place this week. We’ll start with this little guy. He didn’t want to hold still for me after I took this first shot, so it came out the best. It was overcast and rainy and heading towards sunset when I took it. 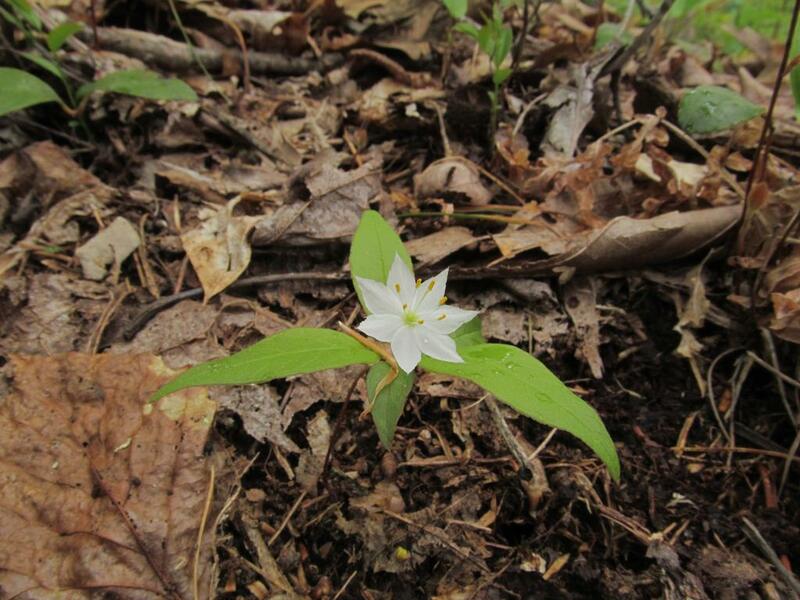 The starflowers have bloomed now. I’ve been watching them for a while, and this week was the first time this year I’ve seen one open. There are lots of them in my woods right now. 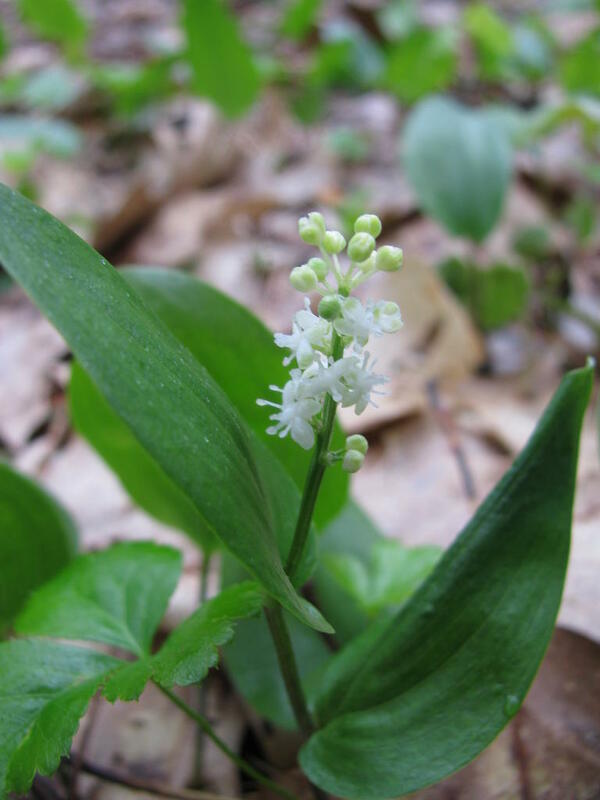 Here’s another one I’ve been watching, the Canada mayflower (Maianthemum canadense). 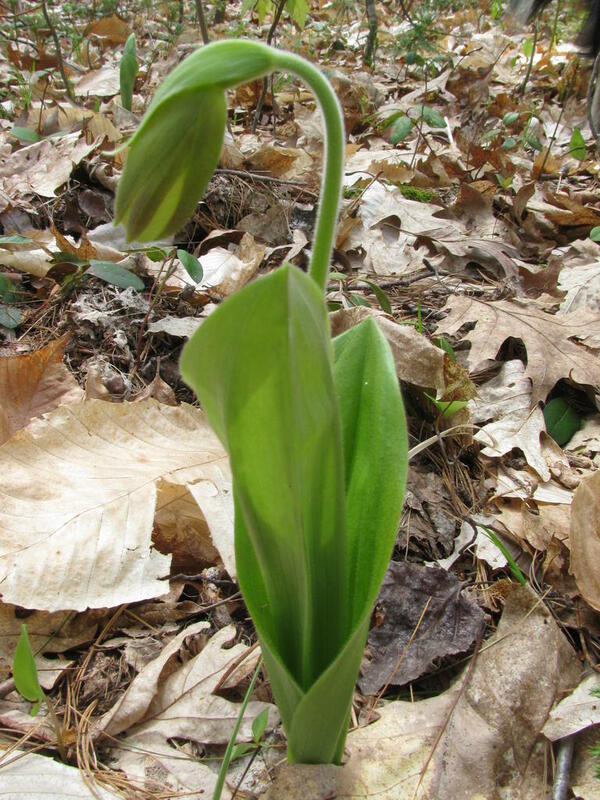 This one has only partly opened, and that’s still farther along than most of them in my woods. 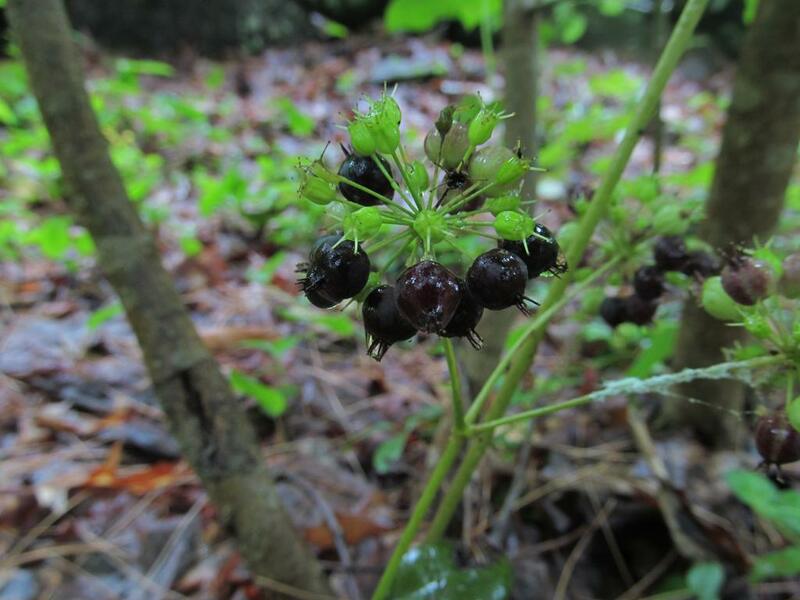 The dwarf ginseng is still in bloom for the most part, but this one has already fruited now. They aren’t in season for very long. They do have edible roots, and I dug a few up and ate them last year. They were pretty good. These are along the stone wall bordering my neighbor, and he has cut a lot of trees (he’s getting ready to build a new house). So that lets a lot more sun into my woods, and I don’t know if these will bloom here again or not. They might get out-competed by sun-loving plants next spring. We’ll see. I guess I’ve done the gaywings about to death now, but I liked this triplet. So here you go again. My chokeberries are blooming now. Most blossoms are still closed, but there are a few brave ones here and there. 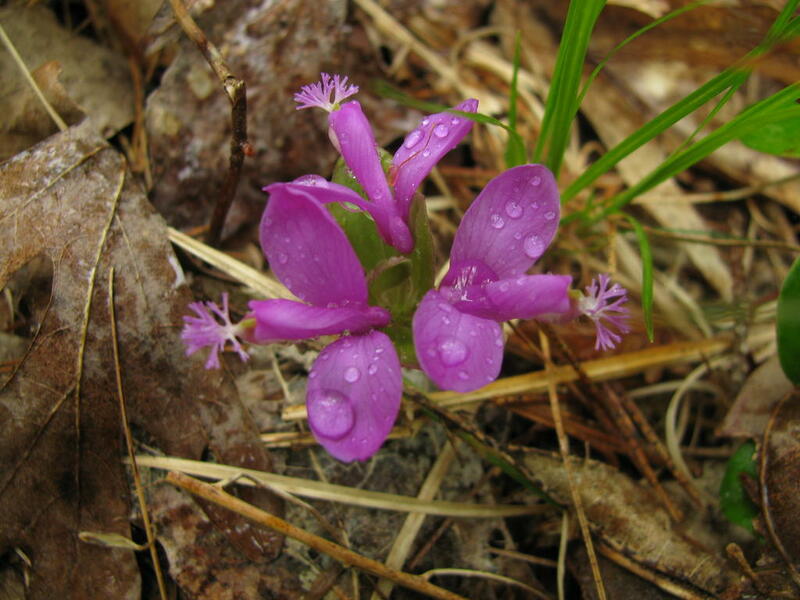 The red stamens fade quickly to pink, and then to brown. I like them best when they are red. I’ve got plenty of wild sarsaparilla to go around. This one is just beginning to bloom. Not all of them make flowers. I’d say maybe a quarter of them do. I have no idea why that would be though. Maybe it’s the conditions here, or maybe they are dioecious (i.e., male and female versions). Here’s another chokeberry. This one has nice and red stamens. 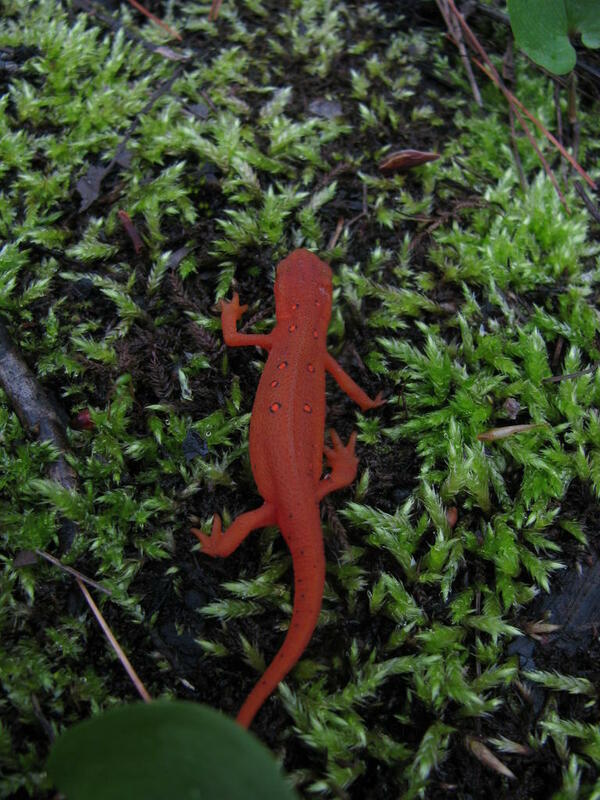 And finally, here’s another amphibian for you. 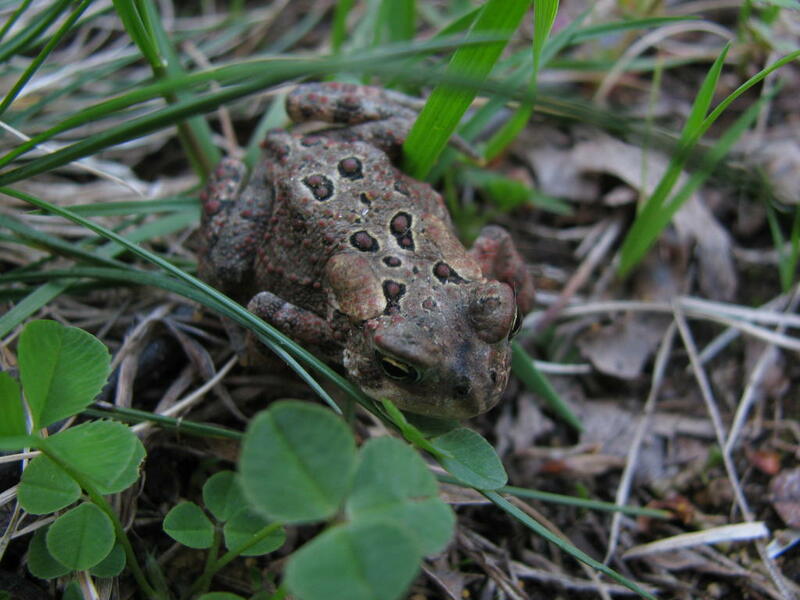 If amphibians were bread, this post would be a flower sandwich. Saturday afternoon I took a walk around my woods to look for (and photograph) wildflowers. I found some. 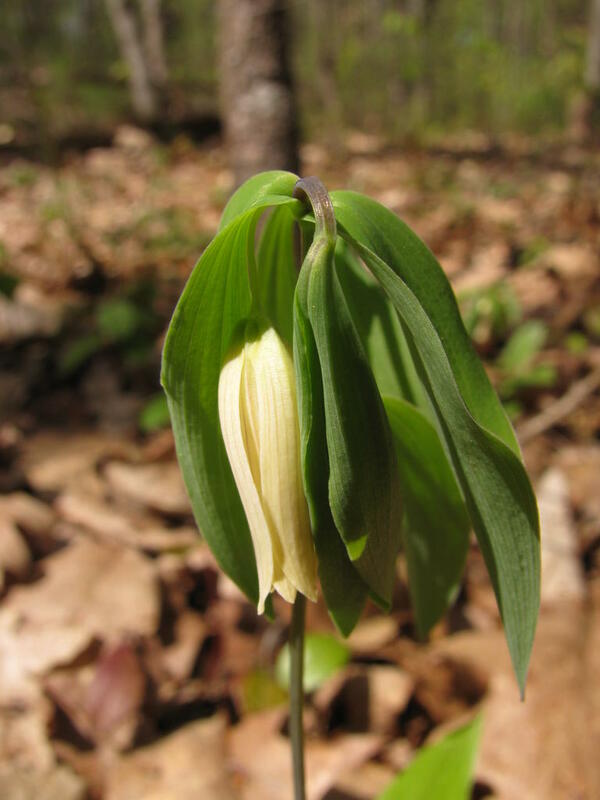 I was looking specifically for some wild oats (Uvularia sessilifolia), so I went to the places where I have found it in previous years. Yup. Found some in bloom. This is another one I went looking specifically for. This is not the same one I posted last week. I looked for that one too, but couldn’t find any sign of it. I have no idea what happened to it, but I guess that’s the way nature goes sometimes. 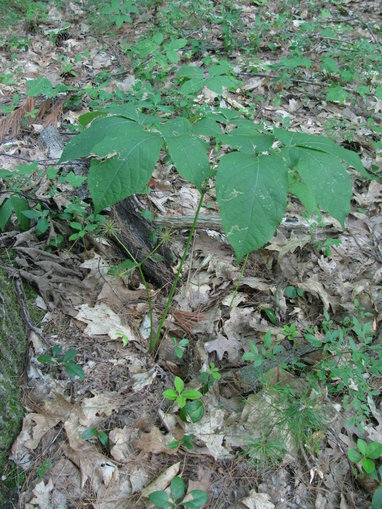 This will become a Wild Sarsaparilla (Aralia nudicaulis) flower. I don’t know that I’ve ever caught one in this stage before. I have dug up the roots of this plant and brewed it into a tea. I don’t think it was worth the effort though, so it’s not something I am likely to repeat. This is one I was looking for. I saw a few when we went camping last week, and they do grow on my property too. So I looked in the usual places and found a few. I suspect I will find even more this week. I was fairly pleased with this photo, so bonus! Here’s another three-leaf plant (trifolius) but with a different Latin conjugation. If I knew Latin, I would probably understand the difference between trifolia and trifolius. I posted an image of one of these last week too, but liked this one enough to repeat it. I do that sometimes. Here’s another repeat. I set out to get a really nice photo of this one, and it turned out OK – not stunning, but OK. I suppose the light was a bit too harsh. It was mid-afternoon when I took the shot, and this one wasn’t in as shady an area as most of the others. 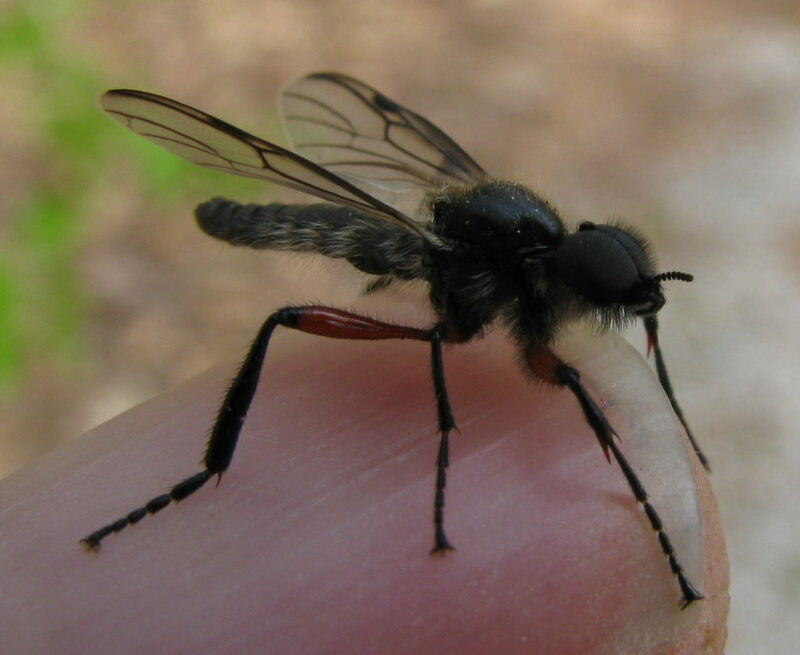 Right after shooting the gaywings, this fly alighted on my thumb. I haven’t tried to identify it yet, but I did think the photo came out pretty well. Better than the gaywings anyhow (even if it’s not as nice a subject). 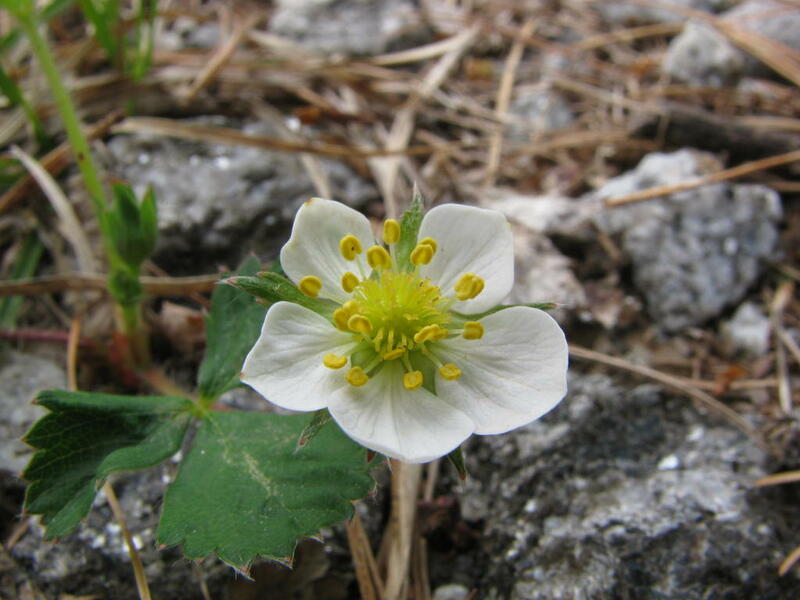 The wild strawberries are still going gang busters. It’s another repeat, but I think it’s worth repeating. I still don’t have any bluets on my place, but I have seen vast swaths of them in fields from the car this week (and last). I might have to stop and get some photos soon. 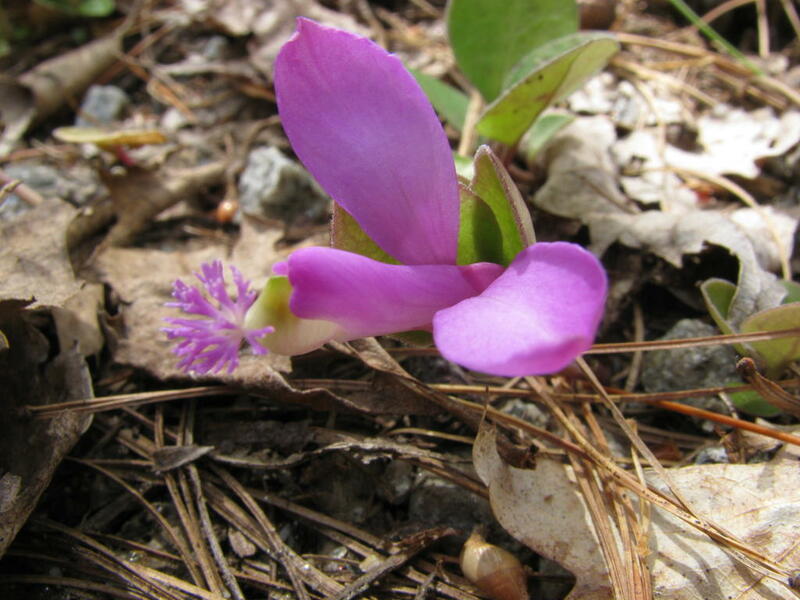 I’ve also been looking for wood anemones and hobblebush from the car, but no luck so far. 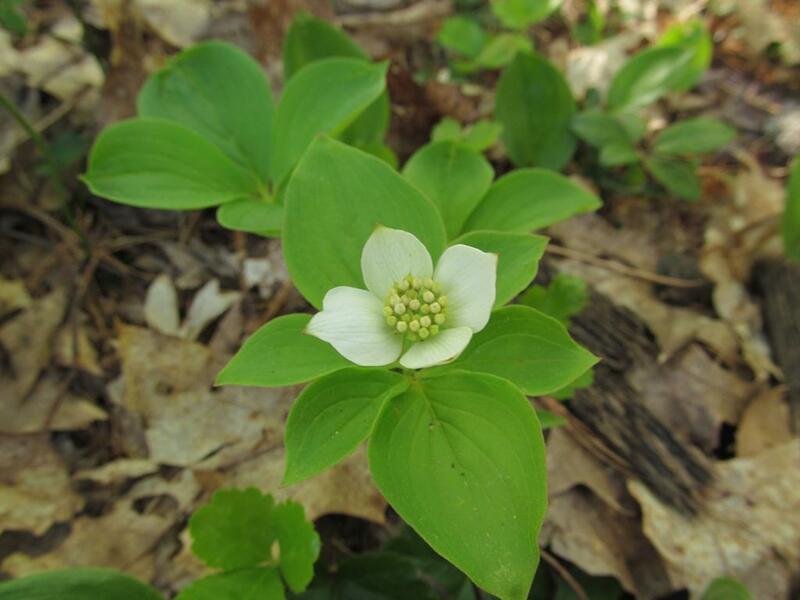 I have yet to see a trillium this year either, and I know those are almost finished now. Maybe I’ll find some in Maine this weekend. I know I will be looking for them anyhow! 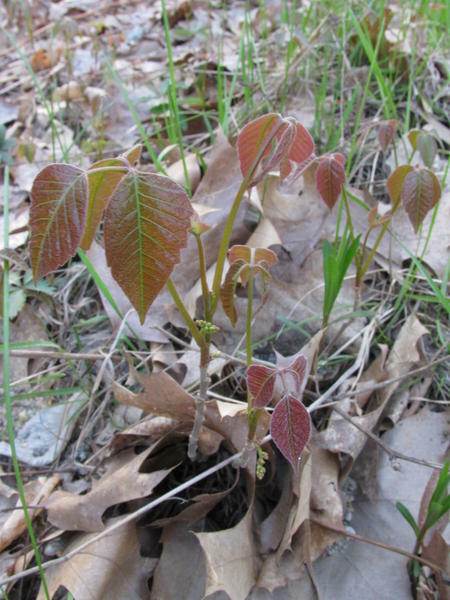 The sarsaparilla will often have five leaflets in a cluster; three at the end of the stem a la poison ivy, and two more bringing up the rear guard. Their fruits and flowers are pretty different too, but I didn’t take any shots of that today, on account of how I couldn’t find any mosquito repellent, and didn’t want to spend too much time out there feeding those brutes. Black flies too, actually. 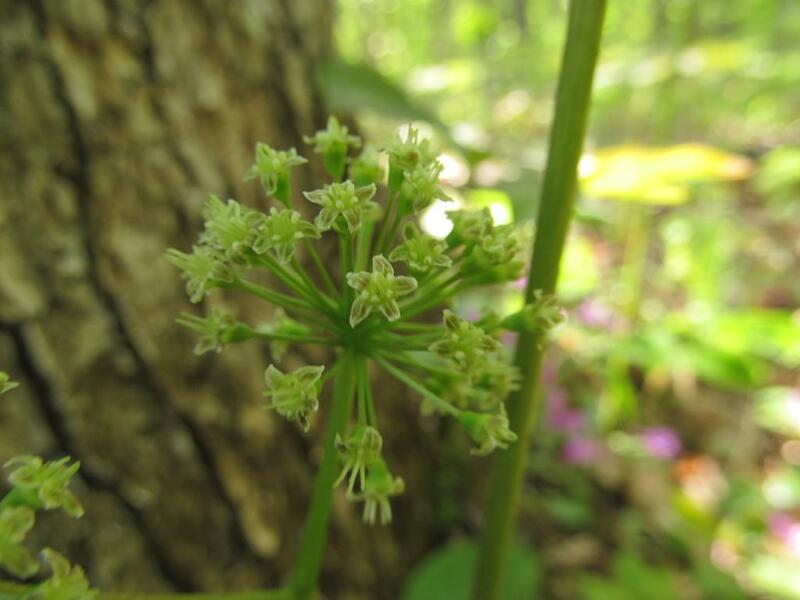 The sarsaparilla sports its blossoms on the end of a separate stem that comes up from the same point as the main stem. 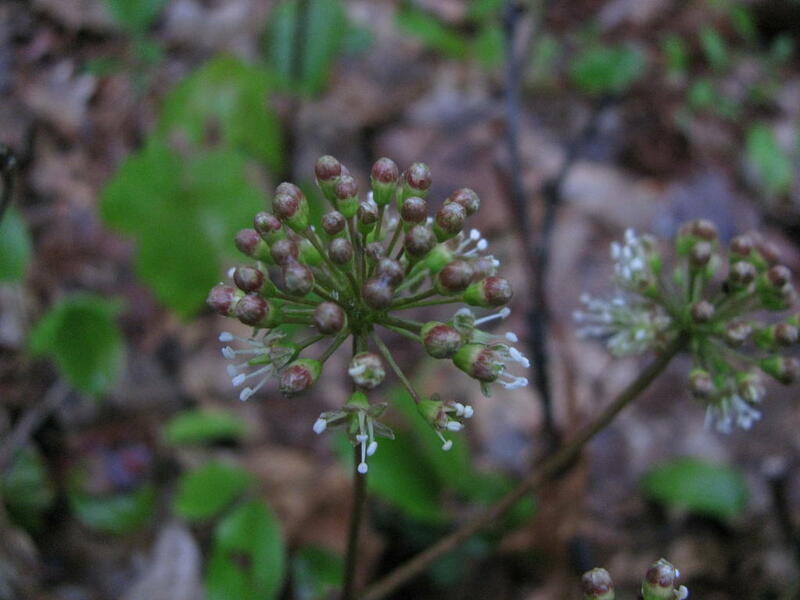 These blooms are held beneath the leaves and form an umbel. 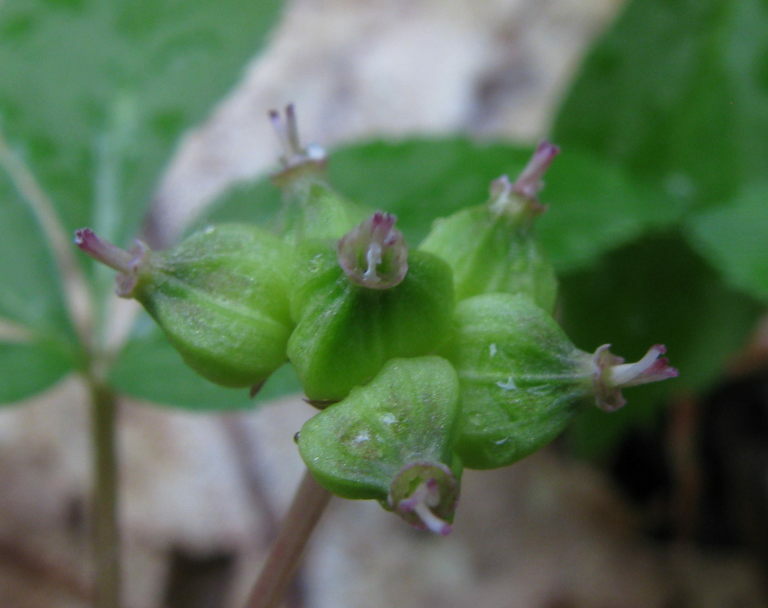 The poison ivy blooms (and thus fruits) share a stem with the leaves. Note how they are both reddish when young. They both go green within a few weeks of emerging. 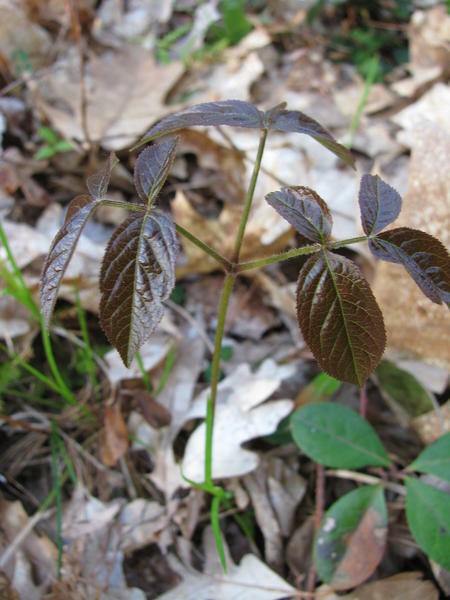 The other day Sandy, a blogger in Maine wrote about Wild Sarsaparilla (Aralia nudicaulis) and asked if any of her readers had ever tried brewing tea from the roots. This is something I had been intending to do for quite some time, so with that tiny bit of prodding, I dove in and tried it today. I dug up six or eight plants I guess. I didn’t count. As I dug them up I wound them into coils and put them in a gallon ziplock bag. 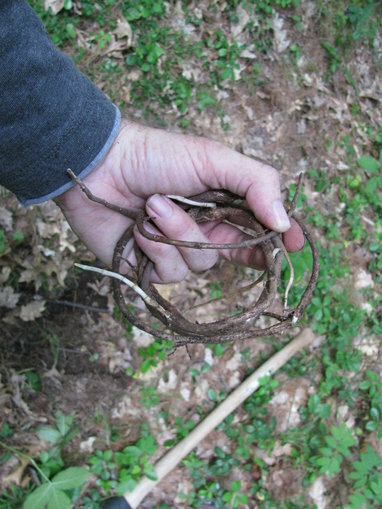 The longest root I dug up was probably six feet long. The shortest was about a foot, but that was because I accidentally broke it off before I meant to. That took no more than 15 minutes. The next step was the wash them off, which I did in a small cooler, the garden hose, and two changes of water. Once they were kinda-sorta cleanish, I brought them in and rinsed them again in the sink. Then I popped the whole nine yards (it might have been nine yards too) into a large pot, covered them with water, and set it to boil. 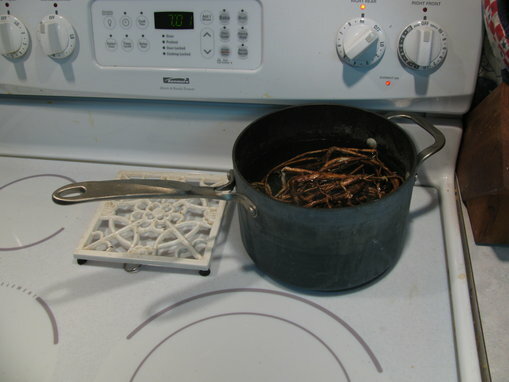 I used about a half gallon of water and let it boil for probably way too long – twenty minutes or so. That was at least enough time to let it change color. It came out a light honey-like hue. It might have gotten darker had I boiled it longer, but who knows? One data point is not really sufficient for drawing conclusions. While it was boiling, more dirt and debris made its way to the surface. I figured a coffee filter would be the perfect way to separate the dirt from the tea, but we don’t use coffee at our house, so I called a neighbor. Beth was up at their house playing with their daughter, and they were immediately dispatched to deliver a dozen or so coffee filters. 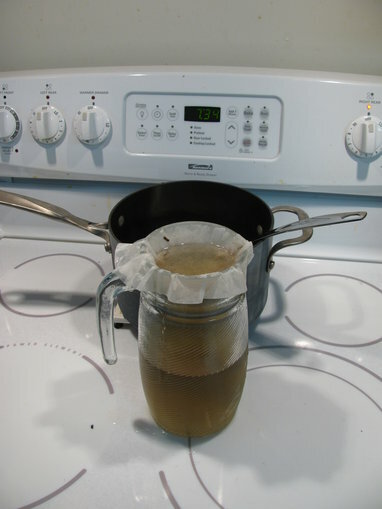 I dipped the tea out of the pot and into the filter which I had placed over the mouth of a pitcher. 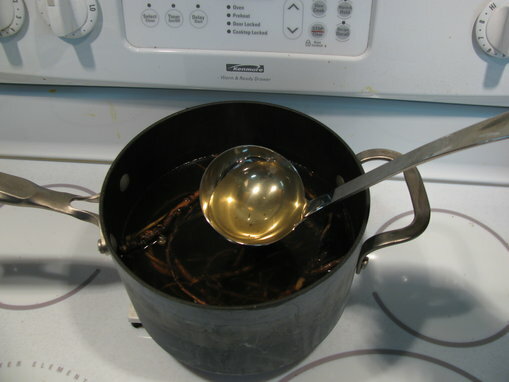 I poured a cup and added a couple tablespoons (again, unmeasured) of honey to sweeten it up a bit (this was recommended in several places I looked for instructions – and none of those places really gave any decent instructions either). So how was it? Well… kinda like wet honey. Comments Off on Open Sasparilla? When Bugs and Daffy missed one of those turns in Albuquerque, they ended up meeting a guy named Hassan. Hassan forgot the password to the cave, and went through several possibilities, including “Open Sasparilla?” Classic stuff. I took that photo last year. The one I took today was just that awful, so I have decided to withhold it from public viewing. I’ll take another shot tomorrow or the next day. 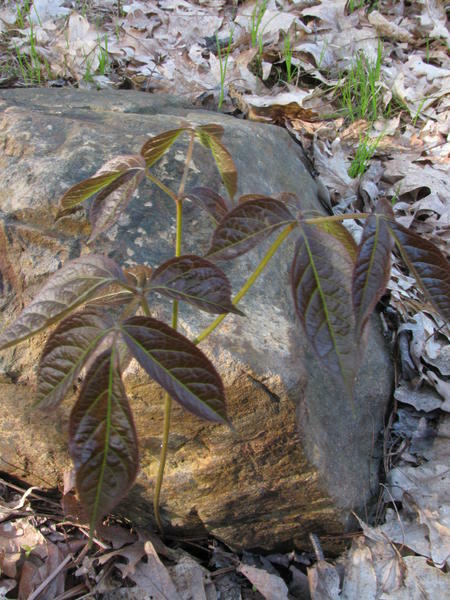 The leaves of both start out a bit reddish and then green up when the plant matures a little, so don’t go by the color. I’m allergic to this stuff, and I think people who claim to not be allergic to it are just wrong. I’m also allergic to fire (it gives me a blistery rash wherever my skin comes into contact with it).